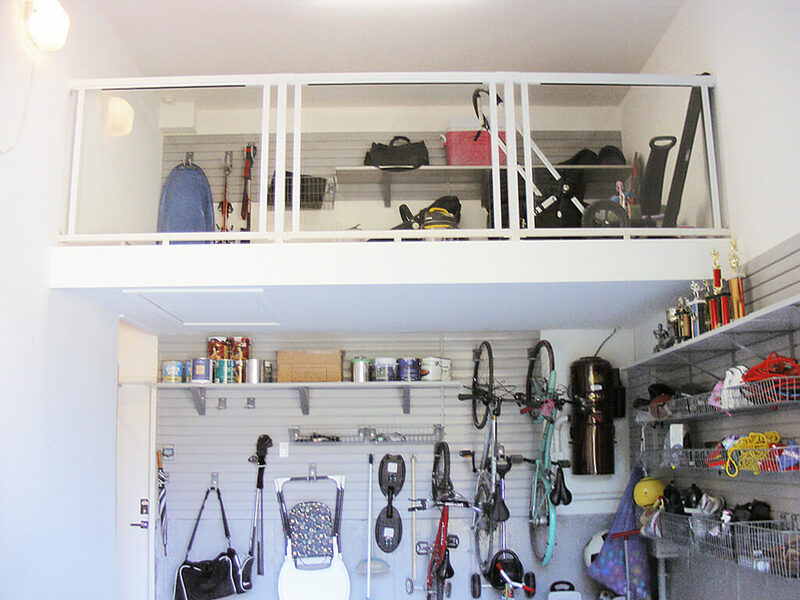 Your garage space and storage needs are unique. That’s why out-of-the-box shelving solutions don’t work for everyone. To maximize the space in your garage, you’ll need to be make the best of use of your available space. Nuvo Garage recognizes that every garage is as unique as the family that uses it. Our approach to creating the perfect garage storage solution begins with understanding your unique storage needs and how you would like to use your available storage space—through every season of the year. Only then can we create a made-to-measure storage solution that will maximize every available square inch of your available space. We create made-to-measure garage storage solutions using a variety of options, including made-to-measure shelving, platforms and mezzanines. Shelving can be installed on side or back walls in a garage to increase the available storage space by storing narrow items high above the floor. There are a number of prefabricated shelving solutions, like Strong Racks, that work well in many situations. However, some garages have spaces with non-standard dimensions. A space that is either extremely wide or especially narrow won’t accommodate most standard, prefabricated shelving. By building shelving that fits your unique space, we ensure that you’ll get the most use out of the limited storage space available in your garage. 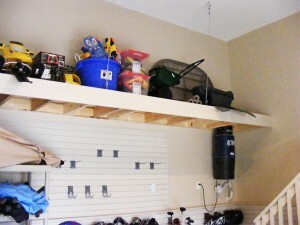 The unique collection of items stored in your garage might not fit neatly onto predefined shelving space. Our made-to-measure shelving solutions can be built to accommodate any item you need to store, from sports equipment and toys to tools and heavy equipment. Most shelving is no more than two feet deep. For larger items that you’d like to store above ground level, a platform may be in order. Platforms are typically installed overhead or at the rear of the garage, with a depth of up to four feet. Platforms can accommodate roof racks and luggage carriers, kayaks and other large items that require storage in your garage. Nuvo Garage offers Strong Racks prefabricated, steel platforms for overhead or back wall storage. However, when prefab options aren’t feasible, we build sturdy, made-to-measure platforms tailored to the unique spaces in your garage. Installing the platform at least 4-feet above the floor will allow the nose of a vehicle to park safely beneath it. While most garages have a limited amount of space, some garages have loads of it. Unfortunately, that space may be overhead, in what many would consider “unusable space.” However, at Nuvo Garage, we don’t believe there are “unusable spaces.” There are simply unique spaces that require creative, made-to-measure solutions to maximize storage. 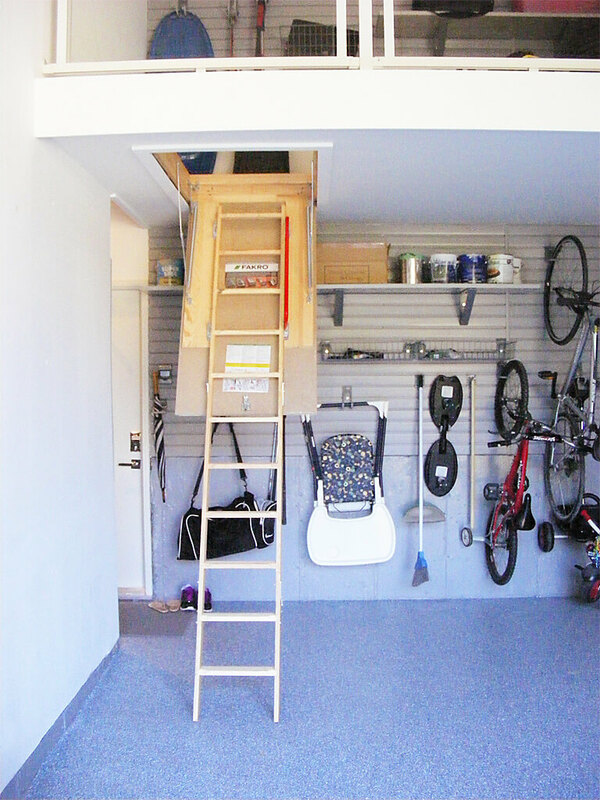 Garages that are at least 14-feet high and deep enough to accommodate an 8-foot deep platform, without inhibiting the garage door rails, are ideal for creating a mezzanine. Mezzanines provide walkable, overhead storage space in tall, deep garages. A mezzanine can be installed at either the back of the garage, or over the garage door, and runs the entire width of the garage. The additional space provided is invaluable for storing light, bulky items, like seasonal decorations, lawn furniture and off-season toys and sporting goods. The mezzanine can be accessed via a step ladder, an attic ladder, elevating staircases or by various other means.Since this overhead storage space is meant to be walked on, a sturdy safety barrier is installed. Each mezzanine is designed to blend into the space seamlessly. So the finishes are chosen to fit the space. You decide how simple or elaborate finishes, like flooring and safety rails, should be. Each garage has its own unique storage challenges: recessed or protruding walls; narrow spaces; limited space; or loads of overhead space. Made-to-measure solutions offer the best option for using all of the available space in your garage. At Nuvo Garage we enjoy the challenge of taking each unique space and maximizing the storage capacity by designing creative, made-to-measure solutions to fit the space and lifestyle of each individual client. Check out some of the incredible garage storage designs we’ve created in garages all over Greater Ontario. Then contact us to request a no-obligation consultation to discover all of the untapped storage potential in in your garage.